Today's recipe is very dear to me.. why you ask? - it was made not by me.. but by 'S' (Are you listening?).... :)) Ok, here is what happened yesterday. I love surprises...truly lady-like.. (jaise filmo me hota hai) I expect 'S' to surprise me ..not everyday..but atleast for special occasions...and as it always happens - 'one always finds their opposites in life'..'S' doesn't believe in the concept of 'surprising'..of any sort - his philosophy about this: "What if the person doesn't like whatever he got? waste of effort, time and money. Right?. Instead take the person to the store and ask him/her to choose whatever (s)he wants..I will pay the bill. ;) Done-done! "..I mean.. 'surprises' do not work that way right?.. I have been struggling to explain this to him for such a long time.. that now I gave up..:)..
1. To make stuffing: Heat oil in pan, add cumin seeds,garlic and onion - fry till golden brown. Then add besan and saute till light brown. Season with salt, turmeric and chilli powder. Stir in yogurt and mix well. Finally add roasted peanut powder and sesame powder. For a paste-like consistency, add a cup of water. Towards the end, add freshly chopped coriander and mix well. the stuffing is ready!! 2. Cut the top part of bell peppers, remove the stem & seeds. 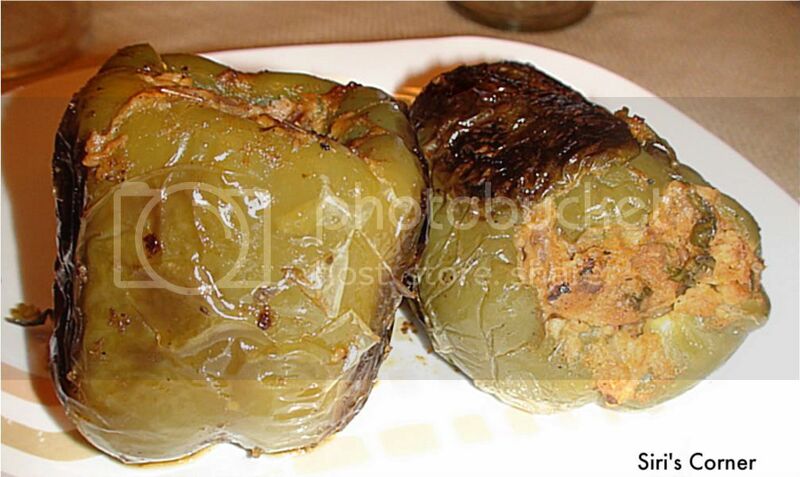 Fill the hollow peppers with the stuffing. Lightly rub the outer skin of the peppers with (oil + little salt) mixture. This is my recipe for Day Two of recipe countdown to New Year, 2010. scroll down the right sidebar of the blog, to see what other marathoners are upto.. Recipe for stuffing, looks very tasty, and its done on stove top which needs constant attention.Love the chard on the peppers. Th stuffing sounds great, I have used a potato stuffing earlier, this is on m list! I just did mirchi ka salan and the sauce was really nutty due to peanuts, next time its not gonna be mirchi ka salan but sauce stuffed mirchi like yours. Thats a Great Surprise..he choosed nice dish too..looks yummy. How nice! The stuffing is really interesting and very different ... love the use of yogurt and roasted sesame seed powder ... very lovely and nutty! and the stuffing recipe is very innovative , have made only with potatoes. nice one Siri [:D]..must say, it is always nice to get a 's'weet surprise like this!! That sure is a pleasant tasty surprise. Pic looks tempting and sure to taste good too. Manasi - thanks manasi. stuffing was indeed yummy and creamy, I must say. do try and let us know how it was..
Vinaya - thanks vinaya. it sures does make one special with little surprises like this. Ms.Chitchat - firstly, I love your name.:).. thanks Ms.Chitchat. you have such an awesome collection of recipes.